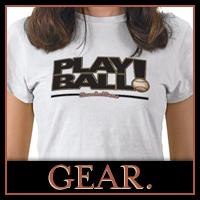 Baseball Fan Jim Babwe’s email submission to Baseballisms.com reprinted with permission. In honor of National Poetry Month, Jim has submitted an offering to his favorite baseball celebrity. Not bad at the plate, not bad in the field, 19 year-old rookie shortstop Pablo Neruda hit .296 for the 1923 New York Yankees. According to George Herman Ruth and President Eisenhower, it could have been .340 or better, but Neruda insisted upon waiting— waiting for the military industrial complex to produce aluminum bats in a parallel universe where he, alone, would understand the value of studying videos of Randy Johnson, for example. Mantle tried to advise Neruda (a hitch in his swing was obvious) but learned how string theories are meaningless when rules require concessions about anything in any dimension prior to their own actual birth. Neruda sneered at Mantle’s disembodied voice, and instead of responding with a string of his own invectives, fetched an inexcusable handful Brazilian dirt from just outside the batter’s box at Wrigley Field, and with no regard for differences between American League and National League boundaries, he pretended to be squeezing an onion then tossed the small clod toward the Cubs dugout. During the brief flight, Neruda observed tiny blades of grass as they were gently swept away from the projectile. Gravity imposed its weak (but forceful), silent, reliable summons. Inexplicably, the dirt clod landed behind an ox yoked to a plow, and Neruda responded to Mantle in Spanish. Let me tell you something, Miguel. an autograph sketched in water. I stole that line from myself. Eventually, those who didn’t particularly approve of Neruda’s style of play were grateful for his impact upon the game. Impressed by increased attendance, The American League instituted a designated poet rule, and even though the changes were later reversed, some say they miss the ways in which writers changed baseball forever. Garcia Marquez (Chicago White Sox) insisted upon sitting alone at the end of the dugout, where he wouldn’t even talk, let alone write during the games. After going AWOL during a road trip to Cleveland, Thoreau’s insubordination resulted in his release from the Red Sox. Whitman reported a week late to spring training and he was immediately traded to San Francisco in exchange for Truman Capote, who refused to sign a contract. A 19 year-old named Joyce spent a year in Albuquerque, but nobody could read his writing. And the crazy left-hander named Cummings proved he could hit for average and power, but broke all existing records for errors in the field. 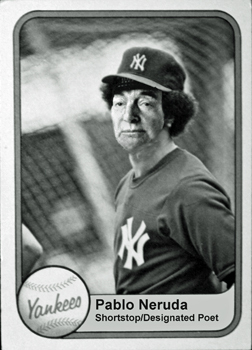 Many years later, when Pablo Neruda accepted the Nobel Prize for Shortstops, Number 7 attended the ceremony, and somewhat reluctantly, spoke briefly to reporters. Not bad at the plate, not bad in the field, Pablo Neruda hit .296 for the 1923 New York Yankees. We were lucky to have him on the team.